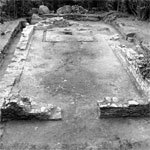 The article presents the results of the archaeological excavations at an extra muros church, situated on the northern slope of the Sarnena Gora Mountain, not far from the village of Buzovgrad, Kazanlak region (Figs. 1–3). Built in the early 6th century, the church was robbed at the end of the century. Most probably, it was temporarily occupied by the same military squad, which had desecrated it. This occupation is evidenced by remains of fire, pottery shards and animal bones found on the floor as well as some specific artifacts (Figs. 4–7). A handmade ceramic jar found in a layer of destructions in the narthex (Fig. 8) provides evidence for another period of occupation. The jar is related to the early period of the Slavic occupation on the Balkans in the late 6th and the early 7th century. Several fragments of discarded and overturned medieval ceramics indicate the time when the church was used as a quarry for construction materials (7th – 9th century) (Fig. 9). The archaeological record in the church in the Cherkovishtata site reveals the turbulent history of the East Roman Empire in the late 6th and early 7th century and the establishment of the new early medieval world. Future excavations will shed light on the history of the Buzovo Kale fortress situated nearby.